Jimmy Kimmel jokingly informed John Stamos on Saturday night that his son Billy was too young to babysit for the Fuller House star's baby boy, also named Billy. The two made their comments in front of E! News' camera on the red carpet at the From Paris With Love Children's Hospital Los Angeles fundraising gala, where the Jimmy Kimmel Live! host was honored with the Courage to Care award. 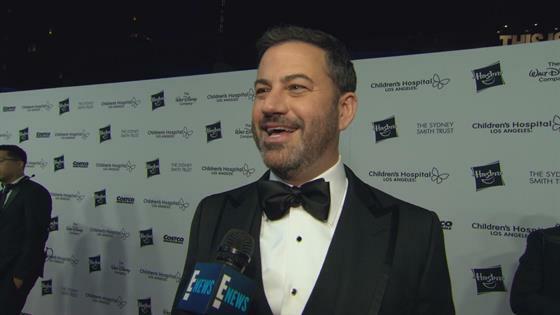 In 2017, Kimmel announced on his show that he and wife Molly McNearney welcomed Billy, their second child together, and that their baby underwent emergency heart surgery at Children's Hospital Los Angeles to treat a congenital defect. Their son had a second similar surgery at age six months. Stamos' wife Caitlyn McHugh gave birth to their son Billy, their first child, in April. "We both have Billys," Stamos said. "Yeah, we do have Billys," Kimmel replied. "A pair of Billys. [Mine's] 18 months tomorrow." "He can babysit ours," Stamos said. "Six months." "No, he's too young to babysit, John," Kimmel said, joking, "John only has one child so he doesn't know—18-month-old children cannot babysit a six-month-old, no." "What about Jane, can she watch him?" Stamos asked, referring to Kimmel and McNearney's daughter. "Uh, no, she's 4, she's too young to watch. They gotta be at least 14," Kimmel continued. "You're no good to me," Stamos replied. During the interview, Stamos congratulated Kimmel on his nomination for the 2018 E! People's Choice Awards. After Stamos left, Kimmel talked to E! News more about his son, saying that the boy is "doing great." "He's very healthy and he's walking around. Every day he picks up a new word. Today it was 'on' and 'off,'" he said, joking, "I dunno how he got them both together but he wants the light on and then off, and on and off until a light bulb explodes." Kimmel and Stamos attended Saturday's gala with their spouses and without their children. Onstage, Kimmel got emotional while giving his acceptance speech. "My wife and I, I know we've raised $4.5 million tonight, we're going to raise it to $5.5 million," he said, joking, "I'm crying because I don't want to part with the money." He talked about his son's surgeries and thanked the nurses and doctors who treated him, as well as his wife. "It really is silly that this award is being given to me because there are at least 500 people in this room more deserving of it," he continued. "Billy for one, he had to have the operations, and my wife Molly who was very strong and she does so much for the mother's still at Children's Hospital. She was the courageous one." Kimmel also thanked Pharrell Williams, who performed at the gala, and Dave Grohl, who also performed with his band Foo Fighters and who had guest hosted Jimmy Kimmel Live! last year when the host was absent for his son's second surgery. "I want to thank Dave Grohl who is much too nice to be a rock star. He filled in for me when I was out for Billy's operation on Halloween and he came tonight to do even more," Kimmel said. "I want to thank Dave, Pharrell Williams, who is also just a wonderful person. I think him being here tonight makes up for the 900,000 times I had to hear the song 'Happy' played by my daughter." Kimmel also got more emotional as he thanked the audience, saying, "I know that there are probably better things you could be doing on a Saturday but by donating and helping to do these people do the work the that they do, you're giving a gift to parents and children's and families that you might never know and ours is one of them, and we thank you because we know this hospital existed long before we needed it."